Mandalas are an ancient design that symbolizes the universe. These geometric designs typically feature a series of concentric shapes or repetitive patterns that lead to an inner point of focus. Modern mandalas come in a variety of shapes, from circles to stars, hearts, flowers and animals. 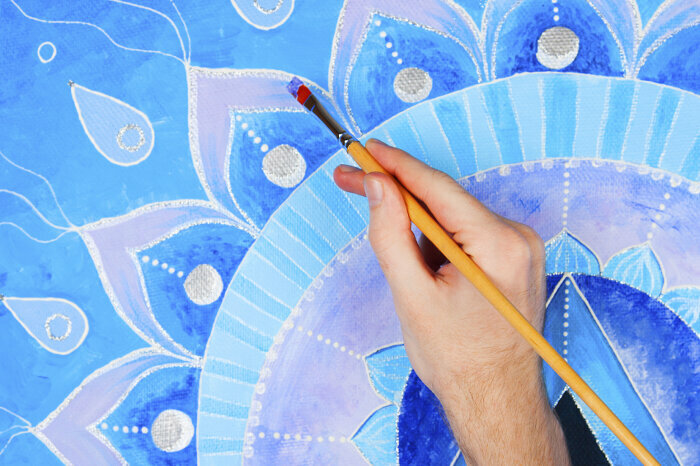 Making your own personal mandala can be both fun and enlightening as you strive to represent your characteristics, values and desires in this artistic form. Take the time to consider the reason for creating a personal mandala. 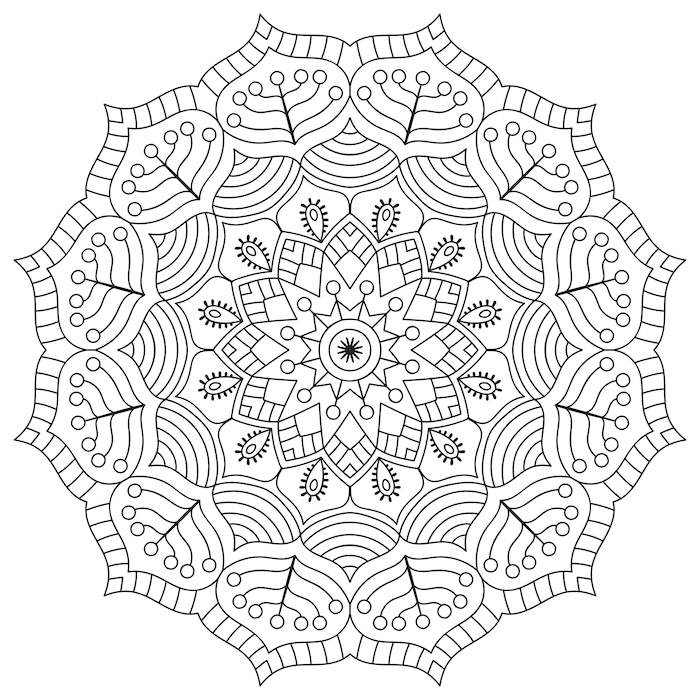 The layout and design of your mandala will vary depending on your underlying purpose. A simple mandala can be made with repeating shapes that you find appealing, but for a more meaningful mandala you will want to choose images and shapes that represent you goals or desires. Consider the meaning of some common symbols to determine if they belong in your mandala. Circles: Circles can represent eternity or the infinite. In religious terms, a circle symbolizes unity, wholeness and protection. It can also symbolize the sun. Triangles: Triangles represents the trinity – either the Christian trinity of the father, Son and Holy Ghost or the new age trinity of body, mind and spirit. Triangles with the point facing upward may symbolize spiritual growth, while those with the point down make represent the physical world. Flowers: Flowers typically represent life and renewal. Leaves: Leaves and vines often represent eternity or rebirth. Hearts: Hearts are the universal symbol of love and compassion. To draw you own mandala you will need a piece of drawing paper (computer paper will do, but it won’t hold up as well), a soft lead pencil, a ruler and a compass or a a stencil of circles. If you do not have a compass, you can use cups, bowls, a roll of duct tape or other round household object in the size you desire. Trace a large circle onto the paper. Typically, you will want to make the circle as large as possible as this is the outer edge of your mandala, but you can make it smaller if you wish. Draw a faint horizontal and vertical line through the circle dividing it into four equal quadrants. You can divide it further into 8ths if you prefer. These lines will serve as guides as you add your designs to the mandala and will help you determine the exact center of you mandala. Mark the point where the lines intersect in the center of the circle. This is the center of your mandala. Draw a small circle approximately 1-inch from the center dot so that the dot is in the middle of the circle. Repeat the procedure drawing concentric circles spaced 1-inch apart until you are within 2 inches of the outer circle. This will create a wider circle around the outside of your mandala. Now that you have the base of your mandala you are ready to begin adding your own designs to personalize it. Draw a shape to fill the inner circle of your mandala. You may wish to draw a flower, a shape or even a special symbol. This should fill the entire inner circle. Fill in the next ring of the mandala with the desired design and repeat the pattern all the way around to fill the ring made by the second concentric circle. Use the cross lines you drew earlier to keep the designs the same size and shape. Repeat the procedure with each ring working your way to the outer ring. Add decorative scrolls or designs to the outer ring to complete the mandala design. Erase your guidelines drawn through the center of the circle. Use a black permanent marker to outline the mandala design. Although this isn’t necessary it will give you a nice contrast and make the design and colors stand out. Color the mandala with colored pencils or markers. Some prefer to use only two colors for coloring the mandala, but you can use more if you desire. Consider choosing a predominant color and an accent color for the majority of the pattern and add a splash of other colors throughout the mandala. Don’t be afraid to experiment with different designs and patterns to create unique mandalas. You can also vary the distance between the circles or gradually increase the distance so that the ring between circles becomes wider as the size of the circle increases.